Dockers Club on Pilot Street. In the area of Belfast known as sailor town. Have you got Google Earth on your computer? 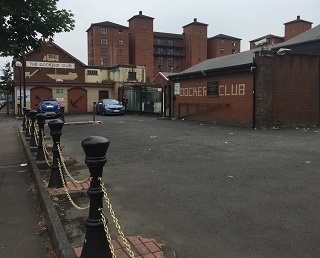 If so, then download the Google Earth view of The Dockers Club. Is this the wrong position for The Dockers Club? If you think so, then modify its position. Click / Tap the button above to get directions from where you are to The Dockers Club. Hello. I've been only once at the Dockers, back in October 2002, and it was thanks to a Belfast friend who told me they were shooting a film down there and they needed extras. It was one of my last days of my usual holidays in Ireland, where I had previously lived in 1997/1998. So I went there -it was a Saturday morning- and after taking my name and giving me some clothes -the film was set in the 60's- a Scprit adjutant instructed me and other people about our tasks in some scenes to be shooted at the entrance of the Gym beside the Dockers Club. The Dockers was, during the shooting of the film, the place to gather, dress up, relax and have some tea and biscuits -the lunch was given in a double deck bus some yards away. The scene we took part in as extras was shot at Pilot St, beside the entrance of the Gym, which was 'reshaped' as it was an Irish pub in Liverpool Dock area. The name given to that 'pub' was 'The Shamrock'. The main character, Jimmy MacMahon -played by the great Colm Meaney-, came out of a car and after kissing his girlfriend bye-bye he headed towards 'The Shamrock', from where a tall Canarian extra and myself -a Basque extra- got out and greeted Jimmy. It took time to arrive to this scene, for the car wasn't in good condition and failed lotta times in the previous scene. But finally they fixed it and could shoot two of the scenes scheduled for that morning. When lunch-time arrived Meaney and other actors/actresses went somewhere into town, to their hotel, we learnt then. The extras and most part of the film crew had a pint in the Dockers and then some lunch served in an old double deck bus parked not far from there, in a backyard. It took time to finish the film in other parts of Ireland, and more time for it to the cinemas. Before that, I read it took part in the Toronto Festival in 2003. Finally I got a downloaded copy of the film, where I was delighted to see my wee participation in the 2nd sequence of the film! The scenes shot at Pilot St, Belfast (this part of the story being set in Liverpool), with the facade of the Gym 'reshaped' as The Shamrock Pub. From minute 2:08 to 3:00. Enjoy it! can anyone remember big johnny tierney at the docks he was also a commediane/ compere was it the queens hall belfast ?